I was lucky enough to be invited again to the recent SIMS Annual Conference. The focus of the conference was on SIMS Primary, the next generation SIMS product. In my next post I’ll talk about the specific changes for assessment in next generation SIMS, but first let’s look at the bigger picture for the whole of SIMS. The next version of SIMS will be entirely cloud based. There will be no option (or requirement) to host SIMS within a school or within an LA. SIMS will be hosted by Capita using Microsoft technology. Instead of three big software updates per year, SIMS release will happen incrementally, like the apps on your phone. Mostly, these updates will happen invisibly to users. SIMS Primary is, unsurprisingly, aimed at primary schools and will be the first version of the new SIMS. Capita aim to release this version to all primary schools from January 2018. At the time I attended the conference just two primary schools had completed a pilot but this number is set to increase in the autumn term, as SIMS support units start local pilots with representative pilot schools in all parts of England and Wales. Feedback from the original pilot schools was positive, with both schools running the new software full time and managing to successfully make their census returns. The assessment part of SIMS Primary hasn’t been piloted yet, but the software has been developed to an advanced level (see my next post) – and looks very impressive. 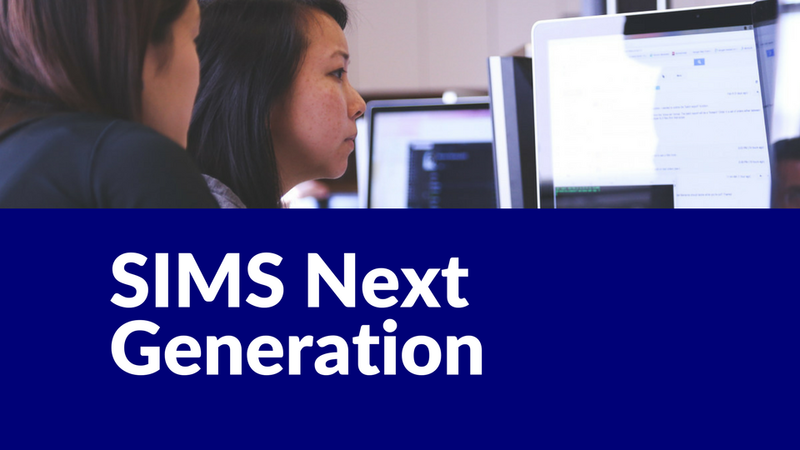 As far assessment is concerned, it’s safe to assume the SIMS Primary product will have many of the features of the current version of SIMS Assessment, along with some important enhancements and usability improvements. If you are a secondary school, you already have access to a new Options module that uses the next generation cloud based infrastructure. Here’s a link to a demo by Capita’s Tony Lockwood. SIMS7 isn’t going away any time soon – it will continue to receive statutory updates – so there’s no immediate pressure on schools to transfer before they are ready. Schools may want to undergo a data cleansing operation before transferring their data, but it’s not absolutely necessary. If your school uses lots of third party products you will need to double-check their compatibility. Once a school has decided to proceed with SIMS Primary, the transfer process is very automated. A patch will be applied to the SIMS7 to enable a new Tools | Transfer to SIMS Primary option for SIMS administrators. The data will then be uploaded to the cloud. New user IDs and passwords will be created. Test transfers can be used to provide familiarity with the new system before a final transfer. After the final transfer the old version of SIMS7 remains accessible, but in a read-only state. Pre-built reports. The report writer behind the new version of SIMS has been completely re-written, so it’s goodbye to the existing and unlovely SIMS Report module. Improved parental reporting in a replacement for the current individual pupil reports and profiles modules – no more tags! In the next post I’ll discuss the changes to assessment in SIMS next generation.